Financial Accounting Software provides comprehensive and fastest solution to manage entire financial transaction records including customer-vendor records, stock information, account details, tax details, etc. Technically advanced bookkeeping program is helpful to prepare various MIS reports including Balance sheet, Trail Balance, Profit and Loss Report, Account Report, Stock Report, Sales Report, Purchase Report and Production Report and also provides facility to view generated reports. Facilitate to maintain income details and company expenses in accurate manner. Provide password protection option for admin section prevents unauthorized users to access/modify software setting. Generate MIS reports like Balance sheet report, Sales-purchase report, Trial balance, Production reports, Ledger report for total calculation and other financial reports related to Tax, Voucher entries, Customers etc. Provide highly interactive Graphical User Interface for all users to easily work without any technical assistant. Eliminate data redundancy and reduces errors of business financial records. Financial Accounting (Enterprise Edition) software is specially designed for various industries such as Agriculture industry, IT sector, Telecom industry, Retail sector, Real Estate, Packaging industry, Healthcare sector etc. 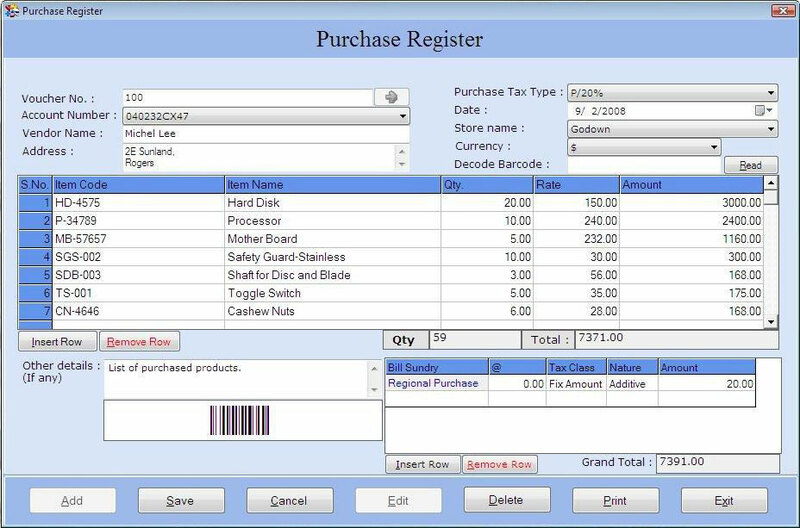 Advanced Financial accounting (Enterprise Edition) utility generates various voucher entry details including sales/purchase, receipt voucher, debit-credit note, payment voucher using barcode setting option as per user’s requirements. Financial accounting program provides barcode setting option to improve accuracy and efficiency to generate financial transaction records. Powerful and reliable accounting software saves financial records in any formats like PDF or Excel. 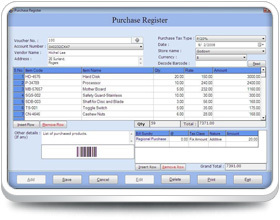 User can easily search and view all transaction records by Voucher number wise, Item code wise, customer wise and amount wise using Financial accounting software.